Calgary’s spectacular downtown library features 450,000 new books, learning spaces on four floors and has been named by the New York Times as one of 52 Places to Go in 2019. Thanks in part to Rachel Notley, the Central Library will also become a hub for Indigenous language. 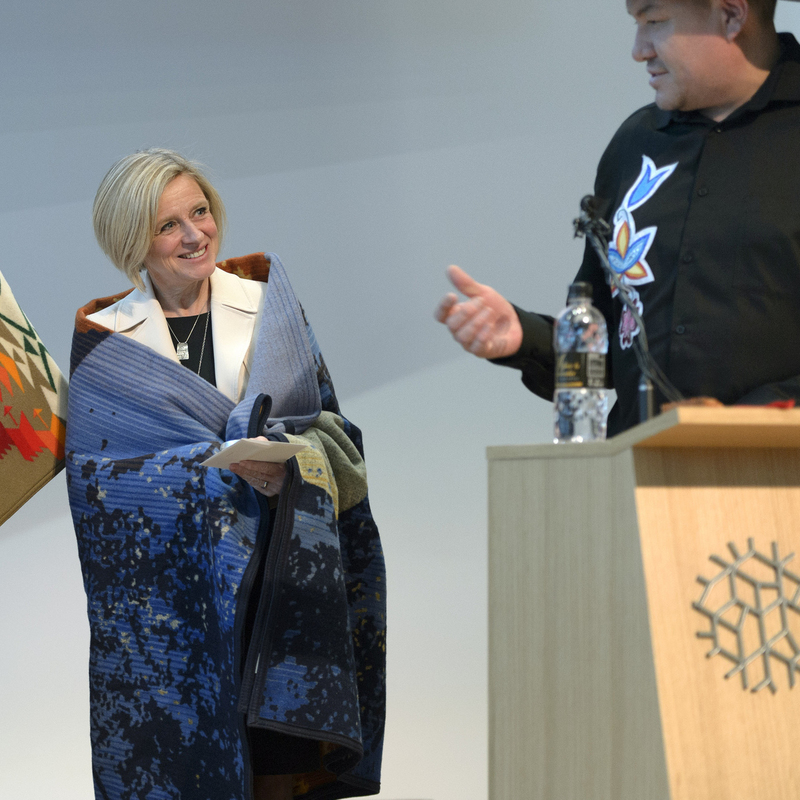 Notley visited the new public library this week to announce a $1 million investment in a new Indigenous Language Resource Centre, which will ensure languages are collected, preserved and taught. Elders will work with the centre through storytelling, guidance and instruction. Notley campaigned in 2015 on improving the Alberta government’s relationship with First Nations, Metis and Inuit people. In addition to public apologies for the Sixties Scoop and residential schools, Notley adopted the UN Declaration on the Rights of Indigenous Peoples as a framework for reconciliation. Alberta is working to bring clean drinking water to First Nation boundaries, helping Indigenous communities build expertise in renewable energy, and incorporating Indigenous perspectives in new school curriculum and in training for public employees. In 2016, Notley’s government brought in a program to allow First Nations and Metis people access local libraries in their communities. Individuals living in Indigenous communities had previously not been eligible for library cards in nearby municipalities. Nearly 4,400 library cards have been issued to people living on a reserve or Metis settlement. Reconciliation is better described as an ongoing process than a destination. While Notley acknowledges more needs to be done, language will be key. The loss of language unites survivors of residential schools, the Sixties Scoop and generations that followed. While language is easy to lose, it’s difficult to recover. With the UN declaring 2019 the Year of Indigenous Languages, the new centre is more than symbolic. Notley’s team has also worked hard to foster Indigenous language in Alberta classrooms. Teachers will be trained in Indigenous languages through a program launched late last year, which will also support Indigenous schools, organizations and post-secondary institutions in revitalizing language. For one of the province’s youngest and fastest growing populations, the recovery of language is a key part in embracing and celebrating identity. For non-Indigenous people, the language centre will be a place to discover and explore a challenging history. Notley expects the Central Library in Calgary to become a hub of Indigenous learning.